Escape to your personal vacation spot, right in your own back yard! Kick back and relax, leaving the strain of the real world behind you. As your eyes close, the sounds of cascading waterfalls and chirping birds become apparent. A mild breeze gently sweeps across your face as you open your eyes to absorb the beauty that lays before you. 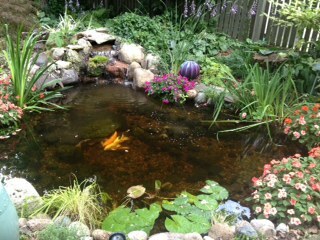 The water lilies and cattails sway with grace on the rippled surface of your own private pond. You watch the Koi swim freely beneath the surface, displaying their unique personalities as they wait to be hand fed. As you take a deep breath and your eyes close once again, you can’t help but think, this is truly a back yard paradise. This is exactly the daily experience our customers in the Chicagoland Area enjoy every day in their very own Backyard. Established in 1992, Frontier Ponds is a full service pond installer serving the Chicagoland area including the counties of McHenry, Lake, Dupage, Kane & Cook. 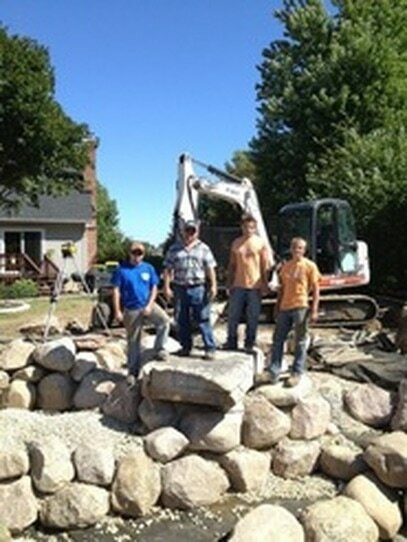 We build custom water features to create a one of a kind backyard paradise to match your lifestyle. We are a small, family-owned company committed to remaining small. By having specialized equipment, lower overhead and fewer employees, we are able to give your project our full attention. From design concept, through construction, to follow-up service, we will guide you in making the right decisions to protect and enhance the value and beauty of your property. We not only design and install water features, but we are here to educate our customers about their water features and the easiest way to maintain them so they can reap the benefits of enjoyment, relaxation, and serenity of their water feature.